Is your client always seeking more information? Do they ask questions? Do they tend to take time to think before they speak? Then you are probably working with an Analytical. 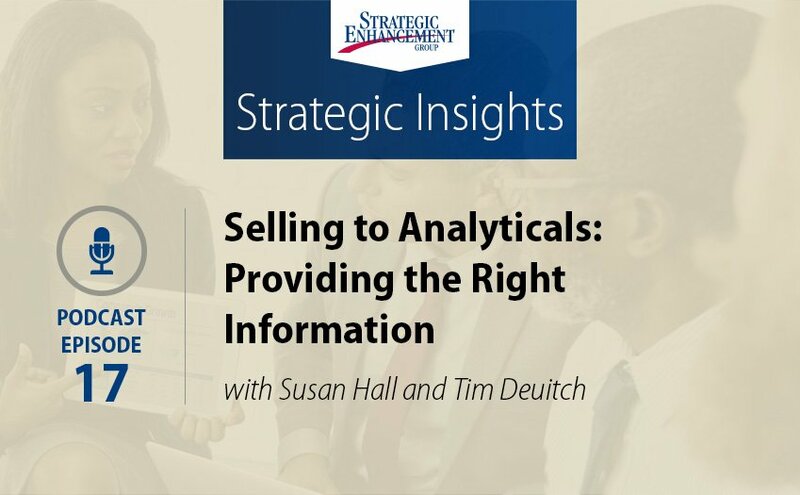 Susan Hall and Tim Deuitch discuss strategies to be more versatile and successful when selling to clients and prospects who display the Analytical social style. 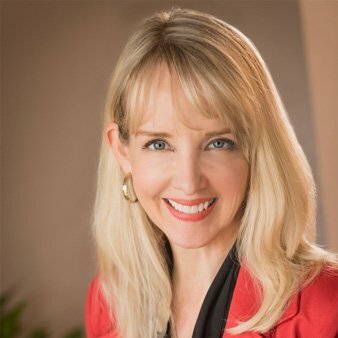 Susan Hall: 00:01 Hello, welcome to the Strategic Insights Podcast, brought to you by Strategic Enhancement Group. 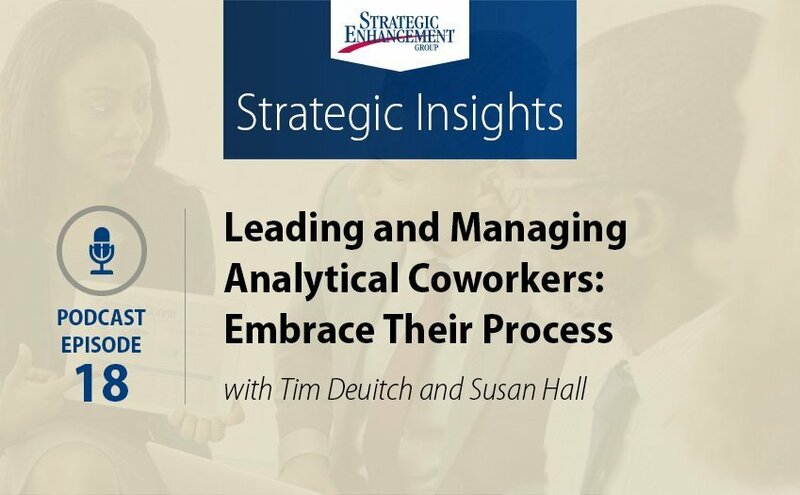 I'm Susan Hall, Vice President Business Development & Performance Improvement, and today I'm joined by Tim Deuitch, Senior Performance Consultant with Strategic Enhancement Group. Welcome, Tim. Tim Deuitch: 00:17 Hi Susan. It's great to be here. Susan Hall: 00:19 Always great to have you, Tim. This podcast is one of a series that addresses the challenges that we often feel when working with clients and coworkers who have different communication styles. There are four styles that we'll speak to. The Analytical style, who is task focused, deliberate, thoughtful, and prefers process. The Expressive, people oriented, verbal. They tend to think out loud, creative, and they're very demonstrative. The Amiable style, which is people focused, diligent, they prefer harmony and collective input, and finally, the Driver style who is task and results focused, likes you to get to the point, and use their time wisely. Each podcast will address one of these styles and today we'll be talking about the Analytical client. We'll start with the characteristics of the Analytical style, discuss some of the misconceptions that other styles often have, and then share several practical tips and action steps that you can take to interact more effectively with your Analytical clients. Sound good, Tim? Tim Deuitch: 01:23 Sure does. Let's get started. Susan Hall: 01:25 Okay, so typical behaviors for an Analytical. Analytical clients are task and process people, they place a high value on thinking things through. They tend to be controlled in their body language, which means that they use few facial or a hand gestures. While they may be listening intently to the conversation, their face just may not show it. They tend to influence others by asking questions, versus making forceful declarative statements. They're methodical and organized in thought, and they like logic, process systems, and predictability. Analyticals typically do not like off the cuff thinking or to be surprised. Tim, how about you? What are some of the other behavioral cues that you see from your Analytical clients? Tim Deuitch: 02:14 I think I'd add a couple of things to that. One is, that they have a real penchant for accuracy. They need things to be right and they'll take great steps to avoid being wrong. So for my clients, it's important that I recognize that and help make sure that they have everything they need to feel comfortable. So, getting it right the first time, even, is very important. Also, they're thoughtful, they need time to process things. Sometimes, that's minutes, sometimes that's days, and they don't mind when you send them things in advanced, because they will look it through. It's not really about being slow. They simply want to consider all the different scenarios and possibilities, and assess risk before making decisions, and so forth. So, recognizing that is really important. Susan Hall: 03:13 I think that's critical. And in fact, it's interesting, because, from a seller's perspective, Analytical is probably the style that's most likely to read what you send them in advance because they want to be prepared for a more productive meeting. Let's talk just briefly about some of the frustrations that the other styles sometimes feel. Each style brings their own strengths to the table and like all of our strengths, they can be a double-edged sword. So with Analyticals, sometimes it can feel because they do like the right information and that's important to them to make a decision. It can sometimes feel like it's taking a long time to get a decision. One of my Analytical clients said this, so I'm actually quoting her, but she said, "Analyticals can tend to overthink things. When an Analytical is going through the buying process, they have a tendency to run different scenarios through their head. So, if A happens, then this will happen. If B happens, then this will happen, which can be certainly a strength, but it can also be frustrating from the salesperson's point of view, thinking through all of those different scenarios and providing information to help address those questions that they may have. How about you, Tim? What are some of the frustrations you've experienced when working with Analytical clients? Tim Deuitch: 04:43 I'll just carry forward from that. The Analytical client is always seeking more information, and again, sometimes those of us in the sales space feel like we've provided enough information, but we have to be ready for them to come back with a lot of "yay, but" questions, "What about this and what about that?" So as you say, as they think through different scenarios, they're going to tend to want more information from you about, "How does this play out?" or "How does that play out? ", and so forth. 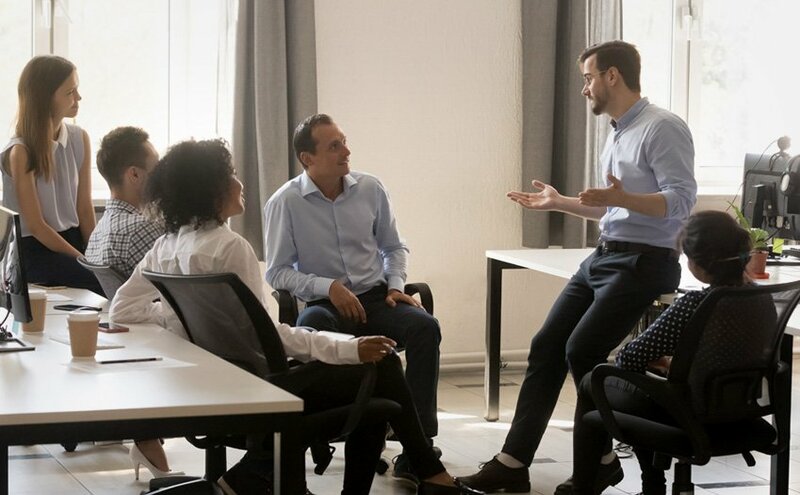 It can frustrate those of us in the sales world that want more decisiveness, or at least maybe on our end on the sales side, it's hard for us to gather a lot of answers, but they'll be asking. Related, you put yourself in their shoes, they can be irritated by situations or people that thrive on spontaneity. And so, a frustration for somebody, for a salesperson that wants them to think out loud with you, well, you're probably not going to get that. Susan Hall: 05:51 I just want to clarify, because this was something that I had to learn the hard way when I was first practicing versatility years ago. With Analyticals, it's not just about having a lot of information. I mean, Aanalyticals are busy people too. It's about having the right information, and I know we're going to jump to tips here in just a moment, but I think a mistake that salespeople often make when testing out their new versatility skills is just to provide a ton of data, and detail, and proposals with lots and lots of words in them. That will frustrate the Analytical just as any other style if it's superfluous information. So it's important to find out what's important to them, what are the scenarios they're playing through in their heads so that you're asking that, you're providing the right information that they need. Does that make sense? Tim Deuitch: 06:48 It does, and related to that, that misconception that people think they don't have that ability to be creative or they don't naturally be creative. What's interesting about it is, if you tell them in advance, "Hey, when we next talk or when we next visit, I'd like to do a little brainstorming with you around this and that." Simply by helping them, by putting them on notice that there'll be this moment of brainstorming, that helps incredibly. Then you suddenly see these things come from them that you wouldn't normally have seen if you were doing it off the cuff. So, they want a clear understanding of what would be the outcomes of being creative or brainstorming, and then time to think about it. Susan Hall: 07:37 Absolutely, and you usually get amazing output in creativity if you give an Analytical time to think about it, you get a fabulous response. So let's talk specifically about some actions and tips you can take to be more versatile when working with Analytical clients. We talked about their propensity to think through different scenarios, which again, can be a real strength. So, as a salesperson, anticipate some of the questions that they have, that they'll need to have answers. "Tell me about your decision making process, what information will be helpful for you to have so that you can make an informed decision." Secondly, in terms of proposals, lay it out in a logical way that addresses their interests and priorities, which hopefully you'll have right through your discovery. Bullet points are fine with Analyticals. They're busy people as well, as we all know, but address to them what's important. If they want to know how this has worked well, give them that data, give them that information in a way that's succinct, not wordy. They tend to think, "Here's my question, here's my answer, here's my question, here's my answer." So, if you can respond and create your proposal in that way, that will give them a comfort level with the quality of your data. Then finally, avoid putting them on the spot. They are far more productive when you ask them to think about something in advance. As you said, Tim, send the agenda ahead of time, any reading materials, they'll actually read it and be prepared for a more productive meeting. How about you Tim? What other tips do you have? Tim Deuitch: 09:24 I'd add a couple. I think this is really important from a motive perspective is that many Analyticals are motivated by respect. They want you to respect them because they do think things through, and they want to earn this respect by making good sound decisions, and asking you good questions back. You're helping them do this and you're showing respect for them by helping them think things through. You can expect them to come back with questions, so give them permission to come back and invite. Say, "Hey, please send me your questions about that, I'm eager to know what you think." That demonstrated respect is really important. Another, and it's all related, is to embrace their penchant for process. They can be very helpful in thinking through the steps of a project or process and can help you see gaps or flaws. So actually, embrace that, and you'll both benefit from that. I think the last thing I'd say is, it's important for them to grasp the logic behind decisions as they're made, or certainly the logic behind anything you might propose to them. Take the time to make sure they know how you arrived at a decision because they'll be wondering that in their mind. Ask for their input in advance, but give them time to respond, even to the decision of the recommendation that you've made. In other words, make sure you make that connection with them and don't assume that connection has been made. Susan Hall: 11:09 Good point. In summary, Analytical clients are task and process focused. They tend to be thoughtful, can be quiet, and like to have a full understanding of the situation or meeting before weighing in. Help them by giving them time to prepare and to get their questions answered. They value systems and get concerns about results if the system isn't buttoned down. They want to be respected for their organizational abilities and they appreciate data, evidence, and research because it validates their input. In short, give them information that they need and time to process it, and you'll have more productive enjoyable interactions. We appreciate hearing from our listeners. If you have additional questions or thoughts, please visit us at StrategicEnhancement.com.